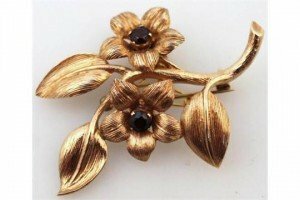 An early 20th Century floral brooch, set with textured leaves, two garnets and a plain pin back with chain. 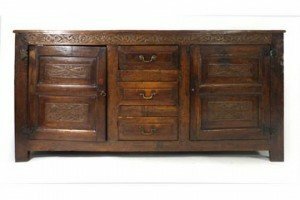 A 17th century and later oak dresser, the moulded frieze over three graduated drawers flanked by two doors on straight stiles. 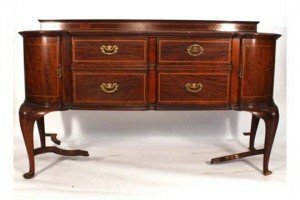 An Edwardian mahogany and inlaid breakfront sideboard, the two fitted cutlery drawers over two further drawers flanked by a pair of doors, on turned cabriole legs with bun feet. 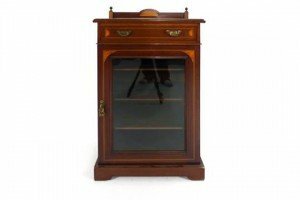 An Edwardian mahogany and inlaid cabinet, the single drawer over a glazed door on a plinth base, bearing an ivorine label for ‘James Shoolbred’. 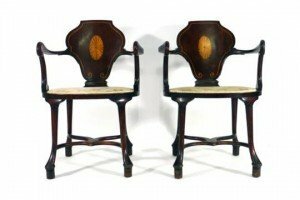 A pair of early 19th century mahogany, patera inlaid and upholstered chairs with shepherd crook arms on circular legs joined by cross stretchers with pad feet. 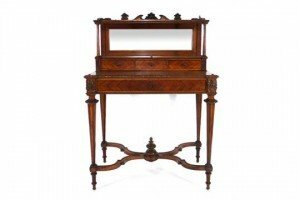 A 19th century rosewood bonheur du jour, the superstructure with three drawers over a single frieze drawer on octagonal tapering legs joined by a decorative x-stretcher. A 19th century rosewood pole screen, the rectangular screen inset with a floral tapestry on a straight shaft with a platform base. 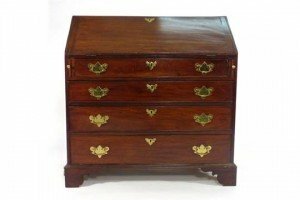 A George III and later mahogany bureau, the fall front enclosing a fitted interior over an arrangement of four graduated drawers on bracket feet. 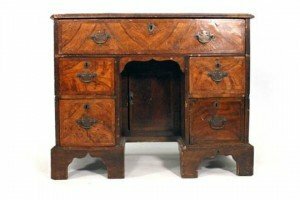 A George II walnut and cross banded kneehole desk, the surface with oval inlay over a long drawer and four shorter drawers on bracket feet. 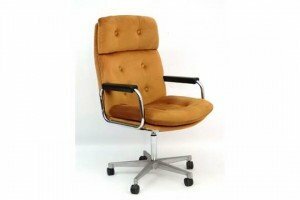 An English Biddulph Tubular Furniture made swivel open arm highback chair, adjustable height, standing on an aluminium 5 spoke base with castors. 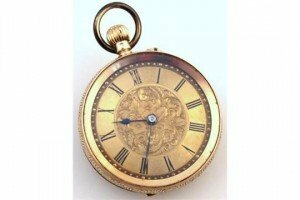 An early 20th Century Continental pocket watch, the 4cm dial with Roman numeric chartering, part etched with flowers revealing a jewelled movement in an engine turned case marked 14k. 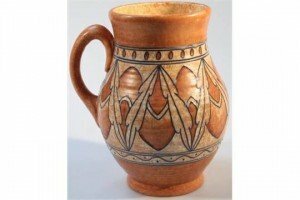 A 1930’s Charlotte head harvest jug, the bellied body tube lined in a grey geometric and floral pattern on a orange ground, on circular foot, further tube line signature mark and Crown Ducal printed mark beneath. 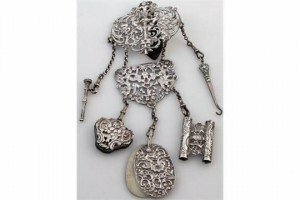 A George V silver chatelaine, with a pierced buckle centre with clip back set with various attachments: notebook, propelling pencil, etc. An early 20th Century brooch, etched with entwined scrolls, blue and red stones and seed pearl with a plain pin and part chain back, yellow metal marked 15c to the clasp. 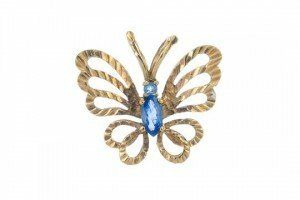 A 9ct gold topaz butterfly pendant. The marquise and circular-shape blue topaz body, with textured wings and concealed surmount. 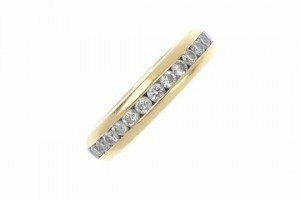 An 18ct gold diamond full-circle eternity ring. 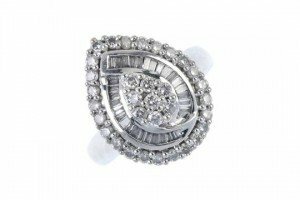 Designed as a series of brilliant-cut diamonds, within a channel setting. Estimated total diamond weight 1.15cts. 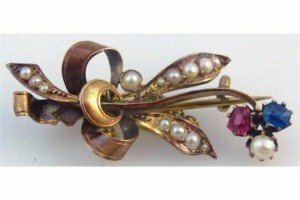 An early 20th century 15ct gold amethyst and seed pearl bar brooch. 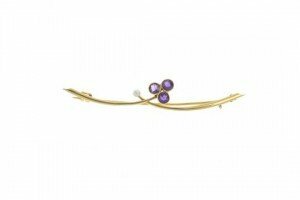 Comprised of two tapered, crossover bars, with circular-shape amethyst trefoil and seed pearl terminals. A 14ct gold diamond cluster ring. Of pear-shape outline, the brilliant-cut diamond cluster, raised to the tapered baguette and brilliant-cut diamond double surround. 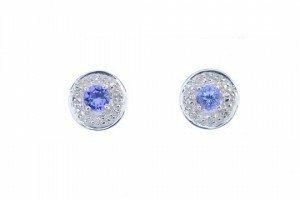 A pair of 9ct gold tanzanite and diamond cluster ear studs. The circular-shape tanzanite, within an illusion-set single-cut diamond surround. 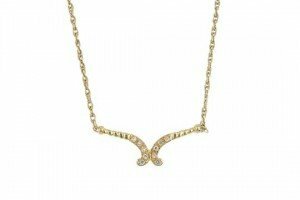 An 18ct gold diamond pendant. The single-cut diamond curved panels, suspended from an integral fancy-link chain. Estimated total diamond weight 0.15ct.